Recent donations to the Newcastle Library's Local Studies Department have inspired us to look back. 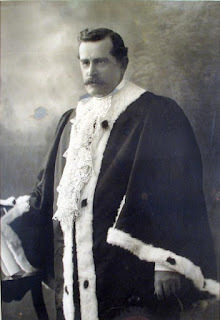 Alderman Robert George Kilgour was a member of the Newcastle City Council, with one brief break of a few months, for 28 years. In that time he was Mayor seven times; no other member has sat on the city's Mayoral chair for so many terms. Born in Cooks Hill on January 31 1867, his father was Mr James Kilgour, one of the first school teachers of the district. Selected as the Mayor 1915, he was described as a "straight goer and an upright honourable citizen." He was elected with hopes to complete the construction of the Ocean Baths and Hunter Street this being a great feature for Newcastle, as the city was destined to become one of the most popular watering places in the state. Ald. Kilgour along with his wife took a most active and honourable part in the local government life of the Newcastle District. His contributions were widespread due to his enthusiasm and devotion to his community in difficult periods. During Ald. Kilgour's occupancy of the chair, the Pneumonic influenza epidemic was spreading all around the world. Largely forgotten, the toll was 31 million globally. In Sydney as well as Newcastle the reported cases were recorded on March 15th, with an increase to sixty three cases five days later in Newcastle alone. Newcastle, even in the worst days of the epidemic, was never subject to the coordinated government planning afforded to Sydney. The country areas were forced to rely on council or voluntary organisations, mainly church groups, to perform the nursing and patrolling functions which were administered by state officials in metropolis. The Newcastle Council organised Influenza Executive Committee that constantly laboured under the difficulty of the securing sufficient funds from the state headquarters, and throughout the epidemic was forced to rely on credit. Council arranged for women to visit the homes of the ill and render any necessary aid. The women of Hamilton established a kitchen where food such as beef tea, custard and jelly was prepared and distributed amongst the needy, and other councils soon followed its example. Three hundred people were provided for by the Hamilton depot alone. These kitchens relied on funds donated by the public or on gifts of foodstuffs. With the hospitals overcrowded and an established preference for home nursing in any case, it was almost impossible to obtain an accurate idea of just how many has succumbed to the disease. The deaths reported represented only those who died in hospitals, but the optimistically low reported death rate was consistently belied by the pages of funeral notices in the Sydney and the Newcastle Morning Heralds. In Newcastle medical practitioners notified two thousand, four hundred cases, with four hundred and ninety four registered deaths, i.e. death ratio of approximately 6% of the population, this in a period of less than half a year! Ald. Kilgour and Mrs B Kilgour efforts in this arduous time were noted by all effected. In three of his terms the World War was in progress. Please visit our Local Studies department to dive deeper into Newcastle's history. Nice to see the Newcastle local history finally sharing some of their records with the community. The uni is far ahead with all things technology and enthusiasm. We'll do some features on the blog so that more people can see them.